Small fish, squid, small octopus, and small crustaceans. Spearing tips: If they’re legal size, they are older, wiser and know when they are being hunted. They get smarter with age. Any aggressive behavior will send them running. If you hold still they may come in closer. jerky movements leave u with a fish-less spear. Due to heavy spearing in the shallows, you’re more likely to find these guys holing up or in deeper water 35 plus range. Slip tips work great with these but they are usually around rocks which and really mess up an expensive tip. Use euro or wood with a cheap flopper….want a real challenge? Use a pole spear. 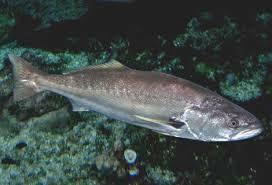 Cooking: a great fish all around for frying, baking, tacos or cooking whole. Ranked #6 in socal top 10 fish to catch. Great in ceviche! Diet: clams, crabs, mussels, sea urchin and other hard-bodied sea creatures. That’s why they have those large human-like teeth. Females- Pink in color or darker in color when younger. Forehead is not as bold. Large human like teeth. All California sheep head are born female and turn to male depending on the environment. Spearing Tips: dive deeper you’ll see more. Like calicos, these have been a bit overfished in the shallows…. so dive to about 35 or 40’ and you’ll see them. 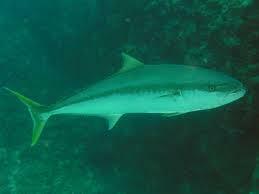 They are loner fish, but You’ll sometimes see them in schools with other types of fish. Less skittish than calicos. Curious fish if you sit still. You can use a flopper but careful, there meat is fragile and can easily pull through the fish. Place your shot well, or use a slip tip so not to loose the fish and make it suffer. Any gun or pole spear will work with these. Cooking: Don’t fry is the meat falls apart and gets mushy. Some consider this fish “poor mans lobster” if cooked correctly. I haven’t tried it yet but I hear it’s a great chowder fish. Steaming seems to work best and keeps the meat firm. Locations: (Deep Rocky Bottoms and Kelp beds. 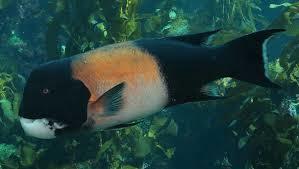 They spawn in shallow kelp beds. 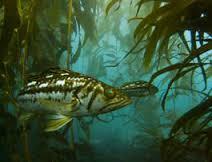 Season Spring- 15feet or less in the kelp Sumer season-20-35 feet of water and like cooler water. Listen for “Croaking” to know if they’re in the area… kinda sounds like “the Predator”… best way I can describe it. Current Regulations: (a) Minimum size: Twenty-eight inches total length or twenty and one-half inches alternate length. (b) Season: Open all year. Spearing Tips: Look for shallow kelp on high tides (aka flood tides). ALWAYS USE A SLIP TIP! This fish will pull through a flopper tip (very soft flesh) and you’ll loose it unless u stone it. These fish smart (hence the name ghost) and spook easily. So, it’s important to stay calm, quiet (silent surface entry) and don’t show aggressive behavior (ie looking the fish in the eye, jerky movement etc) I like to hunt from below…so drop down and look up. You might see one resting near the surface. I like to use power with this fish. Andre wood mid handle 120…. it strikes a big punch. 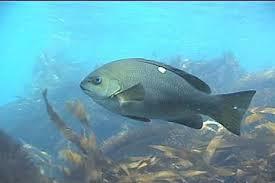 Locations: (May-Oct) They usually like warmer water (high 60’s into the 70’s) Commonly found near Catalina, the channel islands, even swimming distance from our SoCal coast (in the kelp)….Often found in schools around floating kelp patties. Spearing Tips: Unlike Most fish, don’t worry so much about making noise. They are very curious fish. Sometimes flashing your hands, reflectors on your fins, croaking or wearing bright colored gloves can bring them in. Cooking: Arguably one of the best fish you can catch in California. Amazing pan seared and blackened, awesome in ceviche, and is one of our favorite sashimi dishes (toped with ponzu sauce and torched Jalepeno is amazing (see our sashimi prep and yellowtail recipes). Spearing Tips: Very easy to spear. Drop down on the bottom and spear away…. you can also crush up an urchin and that’ll help bring em in. Any gun with a flopper or pole spear. Cooking: Surprisingly not bad. Great frying or for fish tacos…. haven’t tried it in ceviche yet but I’ll let you know. Location: Found in crevasses in Rocks. Migrate at night in groups across the sea floor. Wear gloves, Be quick, and go at night (you’ll have the best luck). Have a solid low profile light that’s not too bright (Too bright and It’ll scare them, stick with about 250 lumens) If you shine the light on them, keep it on them (they tend to freeze. If you move the light, they’ll swim away) then grab from the back or press them down to the Rock or sea floor. Another method that works well, is shining the light next to them but not directly on them. The light will sometimes distract them. Best advice, don’t hesitate, be fast, be aggressive and have fun. Cooking: Put them in ice to put them into a coma and keep them alive until right before you cook them or (if eating later in the week) kill immediately by removing the tail and freezing. Freezing the lobster whole will taint the flavor of the meat. As for Cooking…Butterflied baked and stuffed is my favorite way, also great sautéed in a pan with butter garlic onions and salt and pepper. Fun to BBQ with cajun seasoning. You can boil but careful not to over cook it. These are the diamonds of the sea. Very tasty.